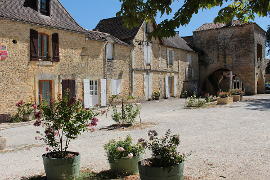 Lalinde is situated on the Dordogne river about 20km east of Bergerac. 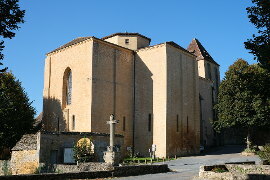 Lalinde is an English bastide founded in 1261. 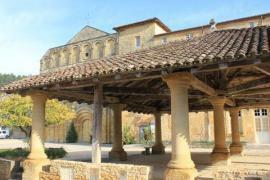 Indeed it was the first of the English bastides to be built. 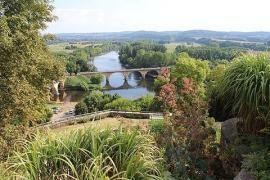 It has suffered in the Hundred Years War and the Wars of Religion and not much remains of the original medieval town. 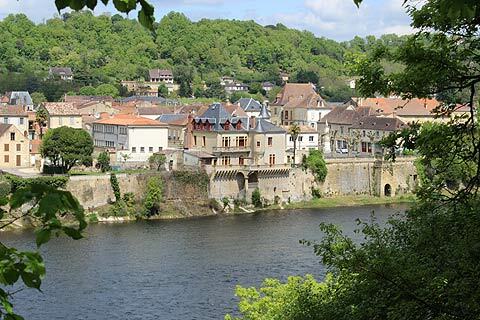 However it is still an attractive town and a good base for exploring the Dordogne. The remains of its medieval past can still be seen in the layout of the town and a selection of colombage buildings (half-timbered buildings). Parts of the original remparts can be seen on the side of the town by the river. 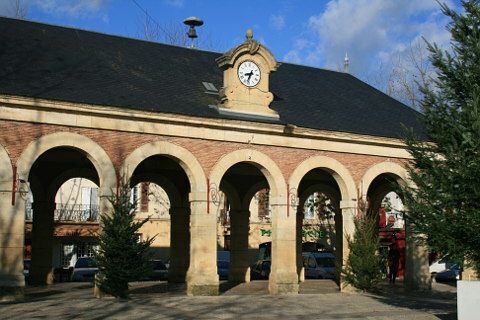 La porte de Bergerac is one of the 6 original fortified gates by which you could enter the town. The base is still in the original stone and the upper half is in brick following a reconstruction after the gateway was burnt down by protestants in the Wars of Religion. 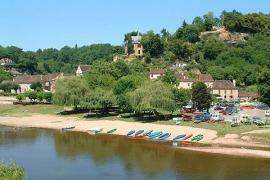 The nicest part of the town is the tourist office and surrounding buildings situated right on the edge of the river. 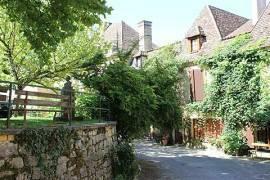 The tourist office is located in a lovely Rennaissance house. Just below these is a little public garden. A lovely place to sit and admire the river and the large stone bridge. 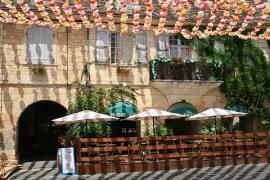 The halle in the middle of the town is an attractive building and is surrounded by various cafes and shops. Lalinde also has a small lake in the town, a nice place to relax and maybe take a picnic. Lalinde has a market every Thursday morning. 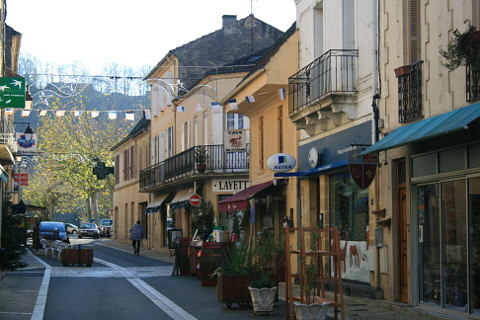 This is a particularly nice time to visit Lalinde as markets in France are filled with fresh local produce and the whole town or village tends to come out to do their shopping and meet their friends and neighbours. Market day is a very social occasion in France. 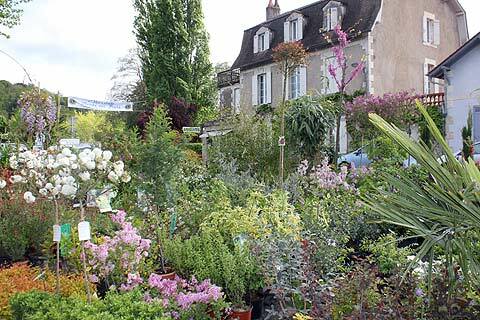 Every spring there is an excellent plant fair in the centre of Lalinde. The Musee de la Pierre is at Lalinde. This is a private archeological and geological collection which can be visited certain days of the week in the summer or by appointment only the rest of the year. 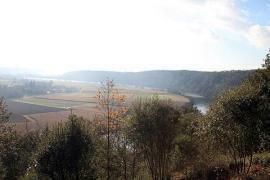 Lalinde is situated between the river Dordogne on one side and an attractive canal on the other. The canal was built over 150 years ago between Mauzac and Tulieres as this stretch of the river was very difficult to navigate. Make sure you visit the locks at Mouleydier, the view up the locks is superb and the canal is a great place for walking and fishing. 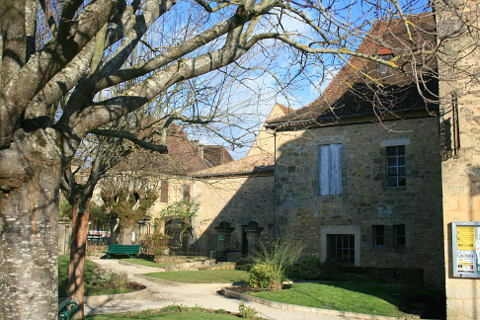 The chateau de Lanquais at Saint Capraise de Lalinde is an unusual chateau as half dates back to Medieval times and half was built in Renaissance times giving you the chance to compare and admire both architectural styles. 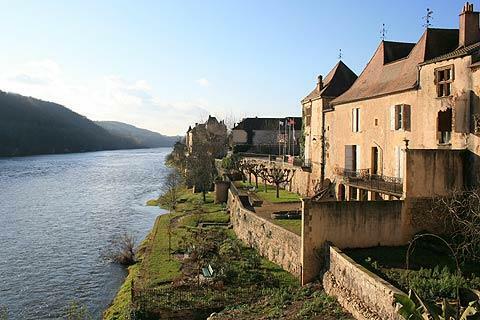 The bastide villages of Molieres and Beaumont du Perigord are both medieval villages worth a visit.